When goal's like the Rampage's first of the evening are going in, maybe it's just not your night. Indeed it was not as Texas lost 4-2 tonight in San Antonio. The absurd deflection goal that Ryan Olsen notched in the first period came at possibly the most extreme angle you can find, right on the goal line. As seen below, no one really expected the tally. San Antonio stretched it out to a 2-0 lead with a goal by Austin Pognarski just 21 seconds before the end of the first. Joel L'Esperance cut the lead in half, hitting the empty net off a fantastic drop pass from Gavin Bayreuther. Within 33 seconds late in the second, San Antonio scored twice, including a 2-on-1 tally to go up 4-1. Texas would score another just as a power play expired in the third, the second of the night for Joel L'Esperance coming off the left wing circle. Texas would pull Philippe Desrosiers with just over three minutes remaining in the contest, but to no avail. The Stars are back at home on Friday against Manitoba. UPDATE: Colton Point was reassigned to Idaho this morning. After a rocky start to the season, the San Antonio Rampage are finding more consistency as they close 2018. Unfortunately, their early record, winning just two games in the month of October, puts them in a significant hole. 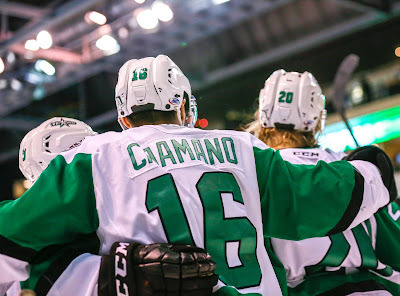 In a bit of positive news for the club, they haven't lost to a team not named the Texas Stars since December 5th. The past ten day's two losses two Texas are a few of the only blemishes on their recent resume. The Stars are coming in very hot. With points in four straight and only two regulation losses in the month of December, Texas is moving up the standings rapidly. After accounting for games in hand, the Stars are well in playoff contention, sitting third in the Central behind Chicago and Iowa. Texas has a prime opportunity to continue their climb with games against the worst two teams in the division this week. San Antonio is today, and last place Manitoba comes to town this coming weekend. The middle frame has been a middling affair for the Stars so far this season, but that was not the case tonight at home. 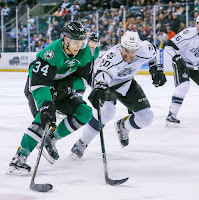 Texas scored three in the second period en route to a 5-1 win over the visiting Ontario Reign. Goals came from five different scorers, and all four forward lines participated in the scoring. "It's just fun when you get everyone involved," said Colin Markison, who scored the first goal of the night. "The ice tilts a bit toward their end, and they feel the pressure. That's the way every team wants to play." "Getting scoring up and down your lineup is key," added head coach Derek Laxdal. "Last game we had three defensemen score. Tonight, we've got our forwards back on the board." With injured players recovering in Dallas, Texas is also driving success from the backend out. Ben Gleason and Gavin Bayreuther, who have both spent time in Dallas this year, were paired tonight and each had a primary assist that came off a booming shot. Joel Hanley had two great chances in the third and scored on one of them. An excited Laxdal noted, "We're starting to get our D-corps back, and you're getting a chance to see what it's really going to look like. It makes a big difference moving pucks." The win was Texas's 6th straight at home. Markison broke down their success in three areas: "We try to approach every game the same way. We're getting great goaltending. We're finding ways to win." Markison scored his fifth of the year on an individual effort. He deflected a Reign pass into the neutral zone, collected it and put it past Budaj to open the scoring. "I thought that [Reign] line brought good energy that shift," said Markison. "Once we took a step back and starting reading it, I just found an opening and it worked out there." 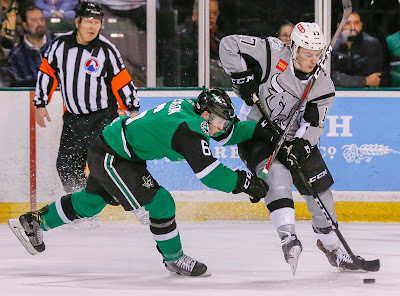 The Texas power play got a boost from the reassignment of Gavin Bayreuther, and it came in handy on the second power play of the game. Bayreuther's point shot found its way through Budaj's legs, leaving a loose puck behind him in the crease. Colton Hargrove tapped it in for his seventh of the year and the 2-0 lead. Just two minutes later, Justin Dowling had an individual effort of his own. He pressured puck carrier Daniel Brickley in his own zone, forced a turnover and then, from behind the net, deflected one off Brickley's skates in behind Budaj. The third period saw Texas collect two more but give up the shutout bid late. James Phelan picked up a rebound off Ben Gleason's point shot and Joel Hanley scored sneaking down from the point to make it 5-0. Ontario found twine on a pass from behind the net late in the third, which shouldn't be seen as a huge black mark on Landon Bow's otherwise outstanding night. Bow kept Texas in the game in the first before the offense activated. "He made great saves throughout the game in timely periods," said Laxdal. "He's taken a step in his development and he's our go-to guy." Texas finishes 2018 on the road with a game in San Antonio tomorrow at 5 PM. 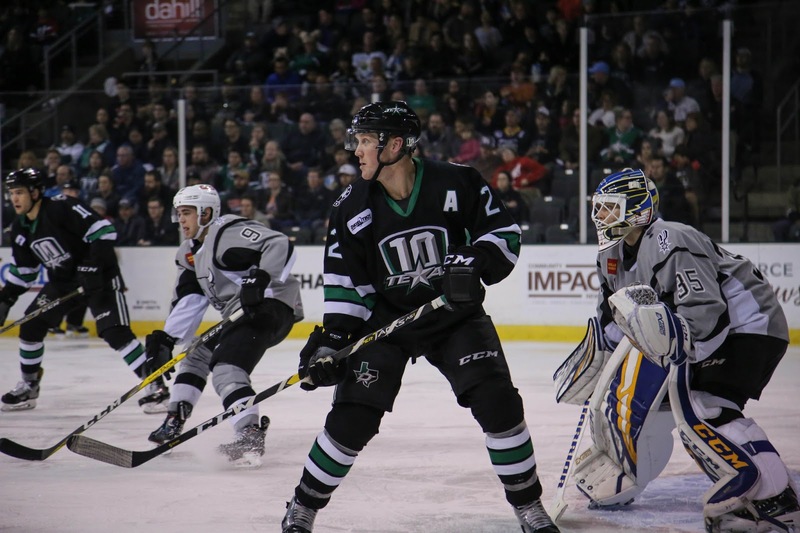 The Texas Stars meet up with a former division foe for the only time on home ice this season. 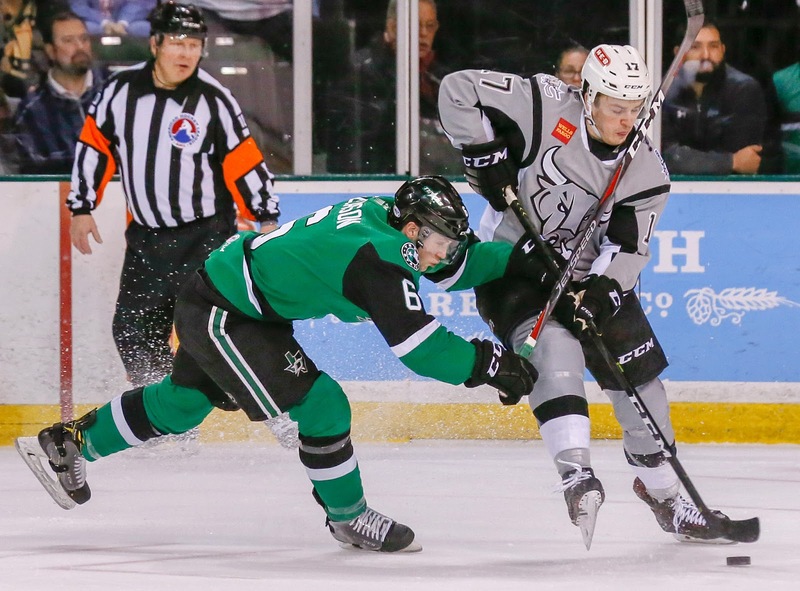 The Stars made a hard break with the Reign this season, only playing two games. Tonight's game finishes off the season series. Ontario took the only game in California by a 5-3 margin back on November 1. Texas comes into the contest with additions and subtractions to their lineup. 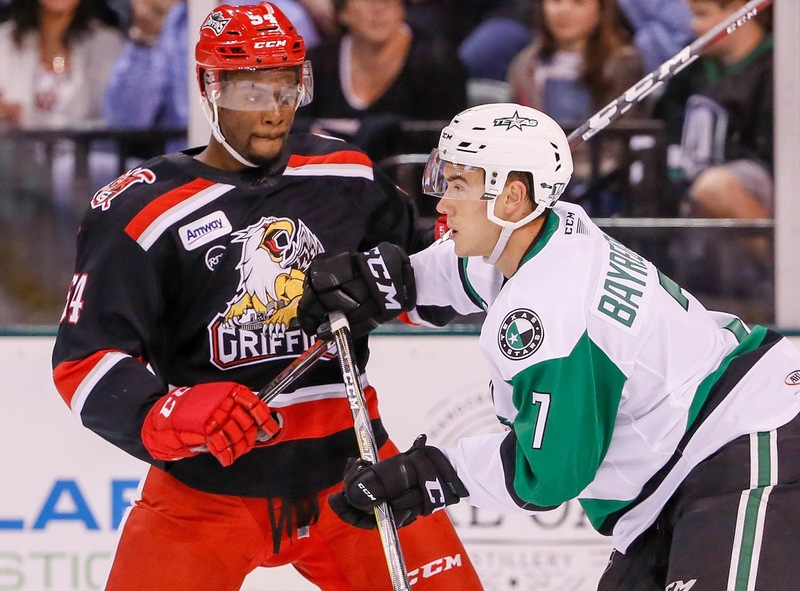 Yesterday, Dallas assigned Gavin Bayreuther, who has played 19 NHL games this season and only 7 in Texas. That was a big add on the backend and gives the power play, which is already clicking, a further boost with his cannon shot. However, Dallas also took away with Jason Dickinson going on IR and Roope Hintz heading back to the NHL. As Bayreuther was assigned, Texas did send Brady Norrish back to Idaho. For what must be the first time in forever, Texas will have the advantage on rest days. The Reign played last night in San Antonio, a 3-2 loss. Texas played on Thursday against the same Rampage. The game was their fifth straight home win and set them at a three-game point streak. Ontario has had a rotating cast of goalies this season, none of them fairing well. Cal Petersen, Jack Campbell, Peter Budaj and Michael Leighton have all had a turn in the Ontario net, and Petersen owns the best record of them all at 4.29 GAA and .881 SV%. It's not been a great year defensively. They average 4.31 goals against per game. With Texas near the top of the scoring table (#4 at 3.77/gm), it makes sense to expect an explosive night offensively. The transactions just keep coming as the Dallas Stars seem to be reacting simultaneously to lackluster play on the ice and injury updates. With Jason Dickinson set to spend some time on IR and Martin Hanzal out for the year, forward Roope Hintz has been recalled to the parent club. Hintz has far and away been one of Texas' best players this season, if not the best. The AHL club will miss his game-changing ability, but believe internally that they have the center depth to weather the storm. With the Hanzal news, it is very likely that Hintz stays in Dallas for the rest of the season, though he may be victimized again by his waiver-exempt status. Power forward Joel L'Esperance figures to slide into Hintz's spot as the second line center. Defenseman Brady Norrish has also been sent down to the Idaho Steelheads, which will provide him with some valuable ice time. The rookie defenseman had been a regular scratch on the Stars lineup card. His assignment opens up a roster spot for Gavin Bayreuther. 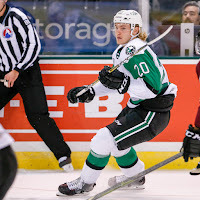 FRISCO, Texas – Dallas Stars General Manager Jim Nill announced today that the club has recalled center Roope Hintz from the Texas Stars. 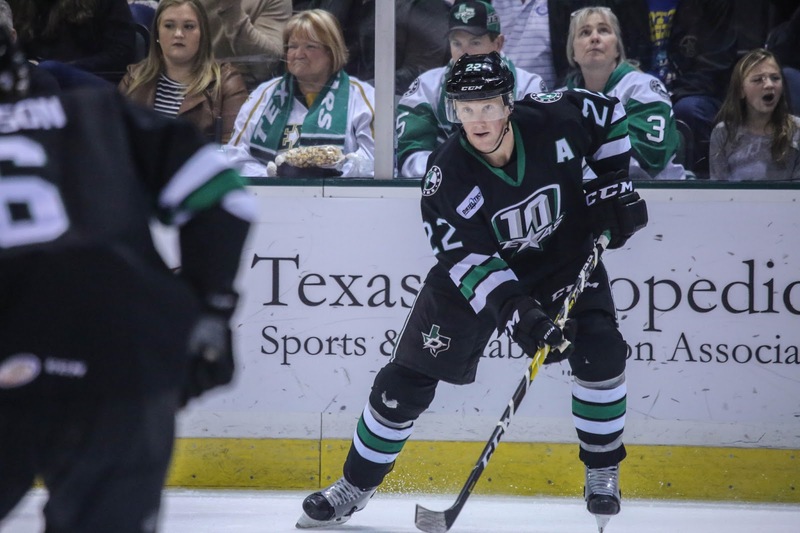 In a separate move, the Texas Stars have returned defenseman Brady Norrish to the team’s ECHL affiliate, the Idaho Steelheads. Norrish, 25, has played 13 games with the Texas Stars and posted five points (1-4=5) from the blue line. Norrish earned the call up from Idaho after playing ECHL 13 games to start the season. The blue liner earned 11 points (4-7=11) and was tied for second in scoring on the Steelheads roster at the time of his call up. The Strongfield, Saskatchewan native played four seasons at RIT before turning pro, earning 55 points (11-44=55) in 100 NCAA games. 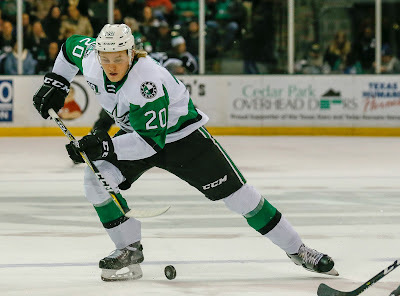 Somewhere in the timeline of this interesting day for the Dallas Stars organization, a flurry of roster moves occurred, including the sending of defenseman Gavin Bayreuther back down to Cedar Park. Veteran blue liner Connor Carrick has been elevated from injured reserve to the active roster, leaving no room for Bayreuther with the NHL club. A horrendous string of injuries on the Stars' back end resulted in the premature call-up for Bayreuther earlier this season. He recorded five points in 19 games played, mostly on third pairing duty. He was also given significant time on the power play with the parent club. 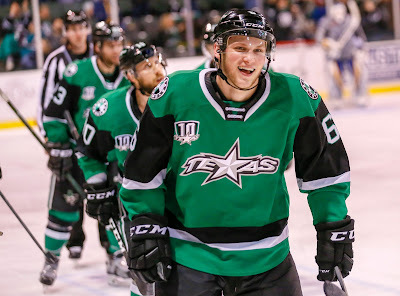 Adding Bayreuther to an emerging young D corps in Cedar Park is going to be an absolute boon for coach Derek Laxdal's club. 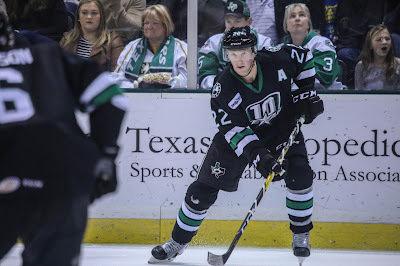 FRISCO, Texas – Dallas Stars General Manager Jim Nill announced today that the club has reassigned defenseman Gavin Bayreuther to the Texas Stars. Bayreuther, 24, has recorded five points (2-3=5) and a +2 plus/minus rating in 19 NHL games this season with Dallas. The defenseman currently ranks eighth among all League rookies with an average 18:11 of ice time per game. 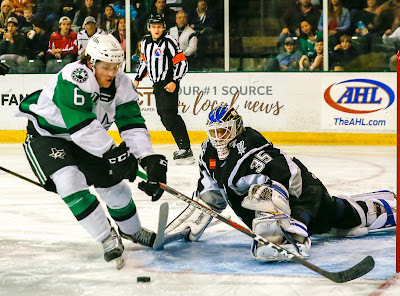 Bayreuther has also appeared in seven AHL contests with Texas this season and has registered five points (2-3=5). The 6-foot-1, 195-pound native of Canaan, New Hampshire was originally undrafted and signed by Dallas as a free agent on March 15, 2017. The Stars continued their winning ways at home in a 5-2 victory over the San Antonio Rampage on Thursday, making it five straight in Cedar Park. Rookie defenseman Ben Gleason was spectacular throughout the contest, notching a pair of goals and an assist with his effort. Second year blue liner John Nyberg also helped carry the scoring load, picking up his first professional goal in the latter half of the second period. Ben Gleason after his second goal. Rampage forward Jordan Kyrou has been on an absolute tear, having produced fifteen points in his last eight games. He added to that total as he scored both of San Antonio’s goals in the first half of the game, once on the power play and once at even strength. After allowing those two markers, Stars goaltender Landon Bow really settled in and finished strong with 24 saves on 26 shots. The Stars buckled in as a whole after Kyrou’s power play one timer eight and half minutes into the game. They went hard on the forecheck and gained significant zone time in the latter half of the frame. Hintz scored his first goal at the tail-end of a long shift after an impressive zone keep and set-up by Gleason with six and a half minutes left in the period. 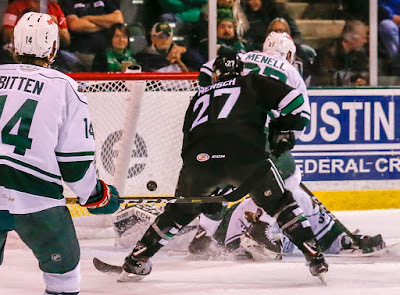 Mersch scored his goal nearly three minutes into the second period when he cleaned up a rebound and roofed it past Ville Husso giving the Stars a 2-1 lead. Kyrou’s second goal came on a slick wrister from the low right circle a couple minutes later to tie. Gleason’s two goals that came in the third period were only eleven seconds apart, and they broke the game open for good. Seven and a half minutes into the period, Justin Dowling set him up on an identical play to Nyberg’s. On the ensuing face-off, the Stars won possession, and Gleason feathered a prayer from the center ice logo. It was clearly an attempt to get a puck deep into the zone, but it took a fortunate bounce through Husso’s five hole. The Stars are at home again for the Ontario Reign on Saturday night. The puck drops at 7:00 PM CST. 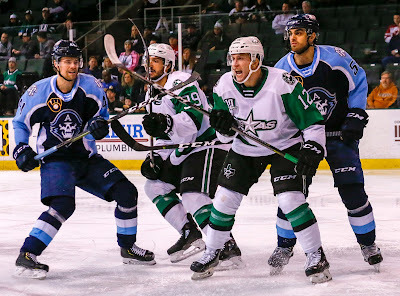 Christmas break is over for the Texas Stars, but they will still get the benefit of an AHL scheduling cookie as they get to stay home against the San Antonio Rampage following the festivities. The two teams split their previous two match-ups before the break with the Stars nabbing an overtime point in San Antonio. After the game last Friday in Cedar Park, Stars coach Derek Laxdal pointed out a couple of areas for his team to focus on. "We didn’t start slow, but [San Antonio] stung us on a power play goal. Then they got a 5-on-5 goal, and I thought we were sloppy with our pucks. I thought they had a little more second effort on 50/50 pucks than we did early in the game." If the Stars are going to continue to collect points, Roope Hintz will surely have a hand in it. Laxdal has been pleased with the Finnish forward's urgent play in his return to the AHL. "I had a meeting with him the other day and challenged him a little bit. I thought he really responded. 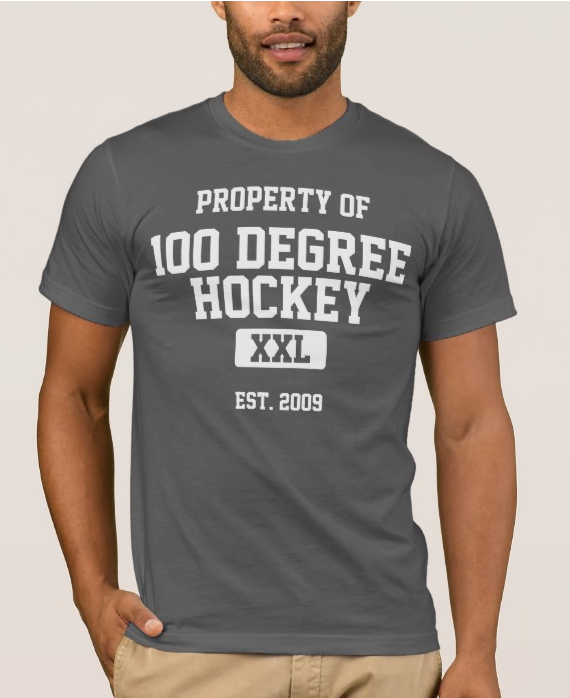 He was physical, and he had great explosive speed through the middle of the ice." The pep in Hintz's step can also be attributed to his new line combination with wingers Nick Caamano and Michael Mersch that has found some chemistry over the last few games. Hintz likes the early returns so far. "I like to play with [Caamano and Mersch]," he said. "I think we get good time in the O zone, and good cycles. That’s the better way to play, when we’re there and not in the D zone." Adam Mascherin's second period rebound goal would be the only one Texas could muster in a 2-1 overtime defeat at the hands of the San Antonio Rampage. 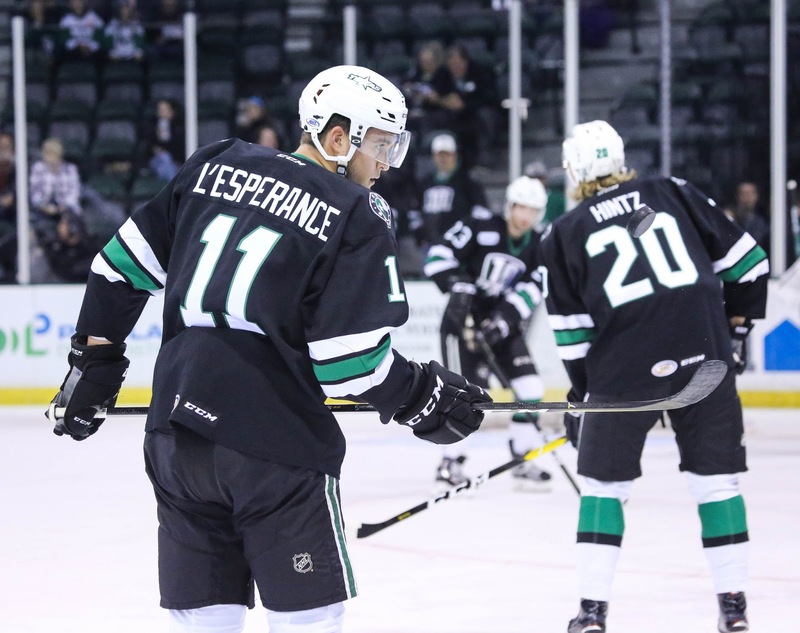 The two teams faced off last night as well in Cedar Park with Texas earning two points. On the weekend, the loss gave Texas three of a possible four, but it was definitely less than ideal to give those extra points away to a divisional foe. Landon Bow took the loss in the contest, stopping 26 of 28 shots against him. Texas was perfect on the PK (4/4) but so was San Antonio, stopping both power play contests in the relatively low penalty game. The Stars scored first with Mascherin's 13th tally of the year coming on the assist from Justin Dowling and Brady Norrish, who was reinserted into the lineup tonight for John Nyberg. San Antonio marched back into the game with a late tally from Jordan Kyrou. Texas survived a late power play by San Antonio in the final three minutes of the third to earn the overtime point. Late in the OT frame, Nolan Stevens collected his third of the year on a tap-in marker on the right side of the open net. Up next, the Stars play San Antonio again on December 27th in Cedar Park. Thanks to oddities of the AHL schedule, tonight's game is the second of three straight against San Antonio and four in five against the club. Of course, when you look at the date on the calendar, it makes sense. Keeping the Stars and Rampage in Texas during the holidays is just kindness, not weirdness from the schedule, so we'll take it. Last night, Texas torched San Antonio after getting things going. Four unanswered with big moments from Roope Hintz and the newly-returned Joel Hanley were key in the victory. 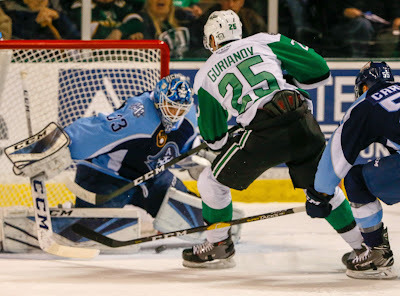 Hintz, with his family in the stands, showed that he may not have anything left to prove in the AHL, especially as Dallas continues its hunt for a second-line center who can generate and score. Coach Laxdal of course noted that the losing team will have a push in the second half of a back-to-back, but also mentioned the perennially terrible ice conditions at AT&T Center. "We have to be ready to play in their building tomorrow night. It’s not an easy place to play. The ice conditions are awful, so we just gotta focus on having a good start and work it from there." Getting a quick start, unlike last night, will also be a key to the game. Finally, taking a cursory glance at the standings is concerning. Taking a deeper look leads to relief. Remember that the Stars have three games in hand on many of the division leaders. If they win those games, they're in first place in the league. If they take 3/6, they're in the playoffs. Points percentage may have been the bane of their existence the past few years, but here it shows a team much better than the "6th place' standings marker suggests. 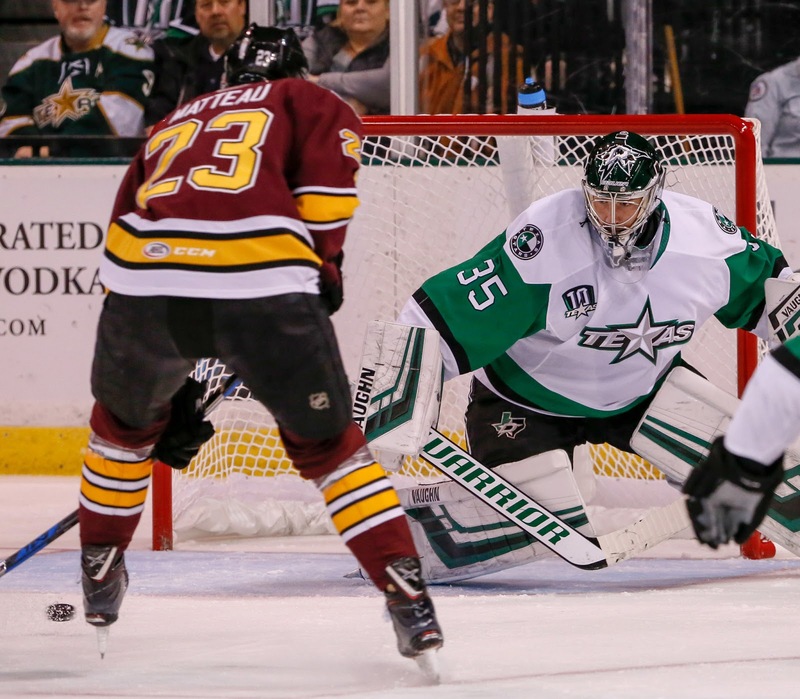 The Texas Stars responded to their recent loss to Chicago with a 5-2 victory over the San Antonio Rampage on Friday night. With his family in from Finland and watching from the stands, Roope Hintz was the best player on the ice and finished with two goals in the contest. 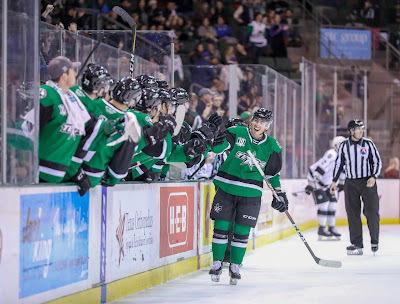 Rookie defenseman Shane Hanna notched his first career AHL goal on a beauty of a wrister halfway through the second period to give the Stars a 3-2 lead, which they would never relinquish. Several other players also helped carry the scoring load with both Nick Caamano and Colin Markison picking up two points a piece. The Rampage scored twice in the first period, and the Stars answered both times within a few minutes. 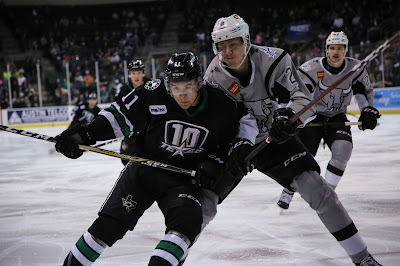 On the first San Antonio goal, Rampage winger Samuel Blais capitalized on a power play, beating Landon Bow from the right circle on the power play just over four minutes into the game. The Stars had been 12-6-1-1 in games in which they scored at least one power play goal heading into Friday. That positive trend held to form. They answered the San Antonio goal during 5-on-3 play as Joel L’Esperance buried the centering feed from Erik Condra with a one timer to make it 1-1. Condra, who had eight points in five games against San Antonio heading into Friday, picked up his 200th career assist on the play. Rampage Connor Bleackley was left unmarked streaking towards the net with three minutes and change left in the first period. He picked a corner on the centering feed and put the Rampage up momentarily. Hintz’s first goal of the night tied it up again less than thirty seconds later on a neutral zone pass from Caamano. “I just try to get ahead of the D and get good position,” said Hintz of the play. Defenseman Joel Hanley also picked up an assist on his first game back in Cedar Park. Bow was not great in the first period, but bounced back in a big way, locking things down for the rest of play. He finished with 21 saves on 23 shots. Michael Mersch earned a penalty shot eight minutes into the middle frame, but his attempt to go five hole only found Ville Husso’s shin pad. What followed was Hanna’s goal to give the Stars the lead just over halfway through the game. “Once we got the 3-2, I thought we started to carry the game from there,” said Laxdal. 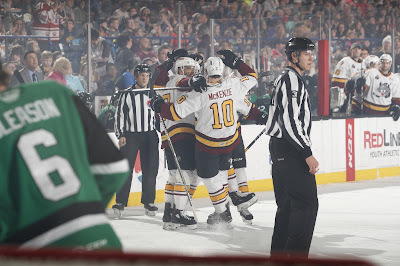 The Stars added the finishing touches in the third period when Michael Mersch tried to find Hintz during a 2-on-1 rush, but was stalled on the exchange by a sprawling defender. He created a loose puck situation instead with a chance from Caamano, and Hintz buried the rebound. Markison’s empty netter with thirty seconds left in regulation pushed the score to 5-2. The tenor of the coaching staff and the dressing room after the game was that the Stars could’ve been better in a couple of areas, but they’ll gladly take the two points as the division standings continue to tighten. The Stars are right back at it tomorrow in San Antonio. The puck drops at 7:00 PM CST. The Texas Stars head into Friday's tilt against the San Antonio Rampage in need something to erase the memory of Tuesday's 6-1 beatdown at the hands of the Chicago Wolves with help from 12,000 screaming children. Though they haven't managed to get their season on track, the Rampage have won three straight and took two out of three games in their series against the Stars in late November. Their roster is a bit picked over with the St. Louis Blues dealing with various injuries, but a matchup with such a familiar foe always brings with it the traditional trappings of a heated rivalry. Fireworks and physicality are to be expected. 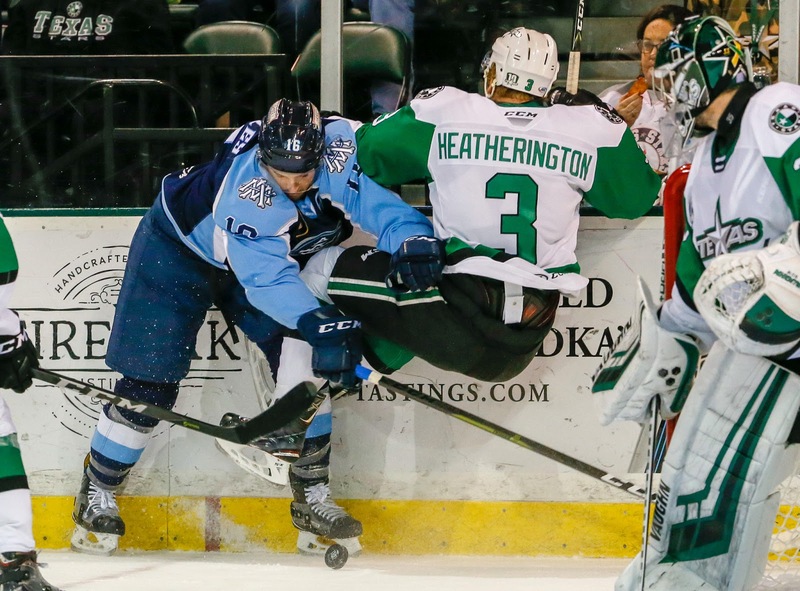 To help them match wits, the Stars just received a boon to their blue line with the re-assignment of Joel Hanley. His call-up was never supposed to be a thing, but injuries forced the organization's hand, and Hanley ought to be a better player because of it. He'll settle things down for a young and improving D corps, but don't expect him to light up the score sheet. He didn't record a single point in sixteen games of NHL action, though that was never his expected role. Either way, he'll be a welcome addition for head coach Derek Laxdal. It's time to forget about Tuesday and think more ambitiously. Can Erik Condra start another point streak? His primary assist against Chicago was money, and now that Brandon Pirri has been called up to the Vegas Golden Knights, one has to wonder how much Condra can challenge for the top scoring spot in the AHL. That's one exciting thing to keep an eye on against San Antonio. 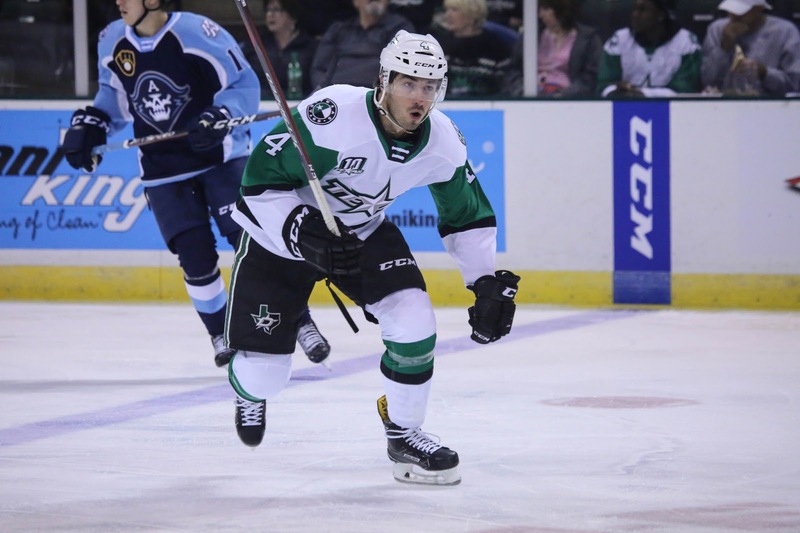 The Dallas Stars have returned Joel Hanley to the Texas Stars this afternoon as the club is seeing its defensive injuries begin to abate. 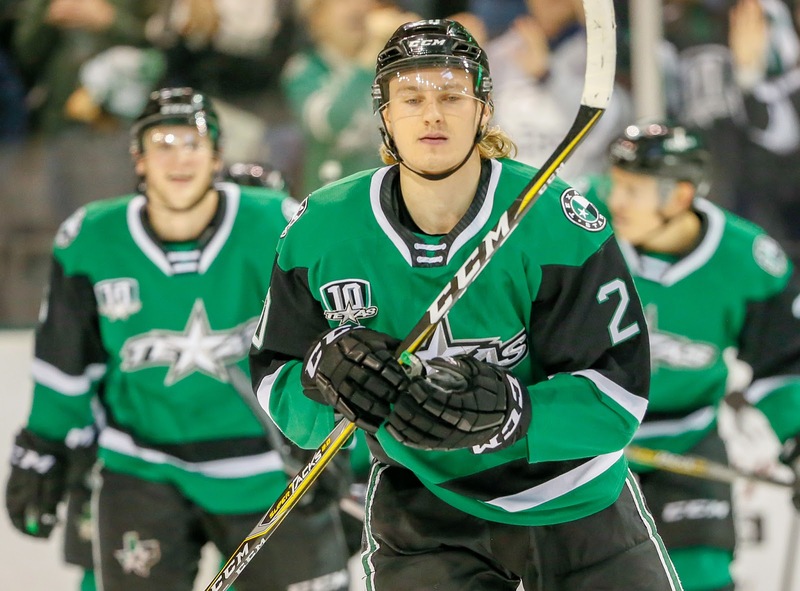 John Klingberg is expected to play for Dallas on Thursday night, sending Hanley to the AHL. In his time in the NHL, Hanley found his way into 16 games. He didn't pick up a point but provided a steady presence for a then- and still-ailing blue line. Coming into the season, having Shanna Hanna and Ben Gleason anchor your top pairing was not the plan. Far from it. Hanley's return will help to further bolster a defensive crew that has weathered the storm and succeeded. Texas is 7-2-1 in their last ten and boasts the second-best PP in the league. Dallas Stars General Manager Jim Nill announced today that the club has reassigned defenseman Joel Hanley to the Texas Stars. Hanley, 27, has appeared in 16 NHL games with Dallas this season and recorded 16 hits, 16 blocked shots and two penalty minutes in an average 13:42 of ice time per game. Hanley has also posted five points (1-4=5) in 11 AHL contests with Texas so far in 2018-19. The 5-foot-10, 190-pound native of Keswick, Ontario was signed by Dallas as a free agent on July 1, 2018. Right from the drop of the puck, today's game was in the hands of the Wolves. In the first six minutes, Chicago delighted the home crowd with three straight goals. The second and third came just nine seconds apart and truly set Texas on its heels. The final, almost predestined score, was 6-1. Texas and Chicago both feature some of the top scorers in the league, and those players were on display today. Brandon Pirri extended his AHL scoring lead with three points. Daniel Carr notched a power play goal and even-strength assist, and Texas's Erik Condra had a deft setup on the Stars first period power play goal. 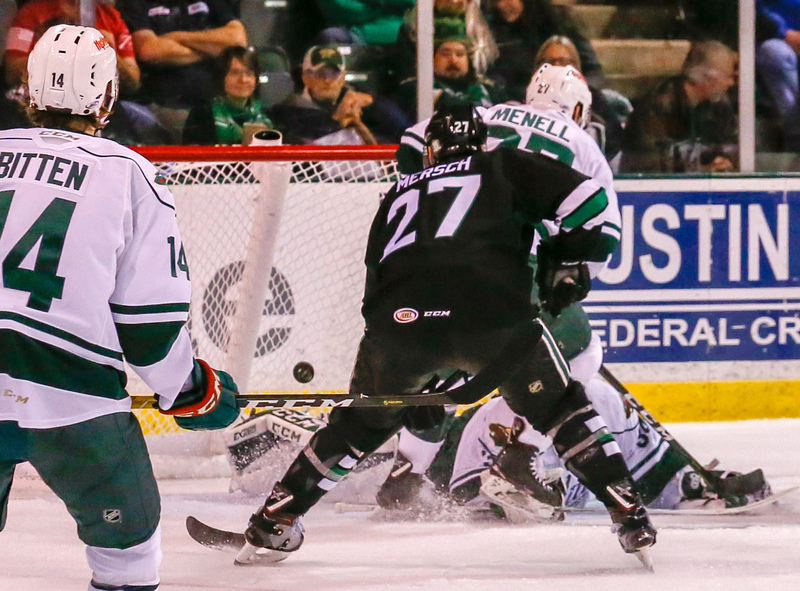 Former Star Curtis McKenzie had a pair of assists to his name. Being completely honest, the game lacked highlights for Texas in a big way. The score was indeed indicative of the play, which isn't always the case. The Stars did not seem to have their game with them as they got started. Landon Bow came out after the first three goals to attempt a kickstart or reset. Bow came back in after just 77 seconds but then was pulled for good after Chicago scored two more in the second frame. Desrosiers would let up one more in the final frame to set the final at 6-1. The Stars will play again on Friday at home against San Antonio. Tonight’s attendance was 12,632 screaming children. Ed. Note: "Gameday" preview coming at you a bit earlier than usual with the morning puck drop. Oh, the kids game, an AHL tradition. Load the stands with school kids on a field trip and get the Spongebob jumbotron hits ready. In its history, Texas has only played host to a single kids game, an 11 AM affair against the Syracuse Crunch. Texas lost to a dazzling performance from the now-departed Ray Emery, who was on a conditioning stint from Anaheim recovering from avascular necrosis. The Stars have played plenty of 'kids' games in Chicago over the years, it seems. The Stars are coming into this one hot, as are the Wolves. After dipping to one game below .500 the Saturday after Thanksgiving, Texas has only one regulation loss since. They're on a strong 7-1-1-0 streak that is going to be tested this morning in the Windy City. Chicago and Texas have already tangled twice on the season with the last one being a spicy affair. Texas rolled to a 7-4 win but not before Maxime Lagace took a slash at James Phelan late in the contest and Alex Gallant came flying into the scene with a sucker punch that earned him a one-game suspension. Chicago has a five-game win streak in tact as they hit today's game. They haven't lost since the aforementioned spicy game. Their conquests include two in Iowa, one of the best in the division, and two at home against Tucson, who is currently second in the Pacific. The Wolves have two players scoring at better than a point-per-game pace, Brandon Pirri and Daniel Carr, at 38 and 31 points each. Today's contest will also feature the league's top three scorers with Erik Condra also checking in at 31 points. Texas catches a break with Erik Brannstrom off the Chicago roster today. The rookie defenseman was reassigned to his native Sweden's World Junior roster on Sunday. Brannstrom has 20 points in 24 games. 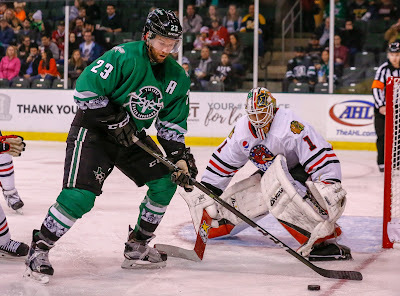 The Texas Stars didn't allow the full two points to elude them a second time in as many nights as they beat the Rockford IceHogs 3-2 in overtime. Adam Mascherin had the game winning goal, while Erik Condra and Joel L'Esperance both chipped in with a tally. The Stars went 1-for-4 on the power play against Rockford's third ranked penalty kill unit with Condra getting the marker. 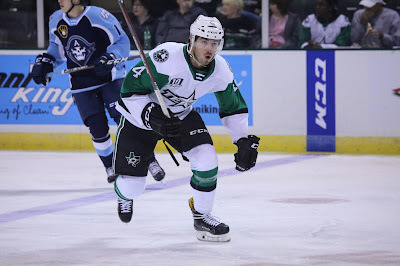 Travis Morin set Condra up nicely in the slot for his fourteenth goal of the season to put the Stars up 1-0 in the opening minutes of the middle frame. James Phelan was called for goaltender interference with a minute left before first intermission, and the IceHogs cashed in with only four ticks left as Jordan Schroeder got a stick on a rebound to swat it in past Phillippe Desrosiers. 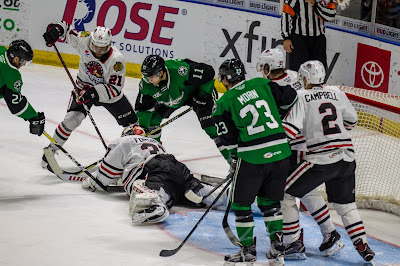 The potential was there for that play to become one that deflates a team, but Desrosiers played strong throughout the contest and matched Rockford tender Anton Forsberg save for save. Desrosiers battled through two big breakaways in the second and third periods, which he confidently snuffed out. He also was the recipient of a reckless play by Rockford winger Nathan Noel as he came barreling into the crease unimpeded in the third period. There was no call, which could have been frustrating considering Phelan was called for far less an infraction. No matter. Desrosiers finished with a sparkling 32 saves on 34 shots. The IceHogs pulled ahead by one eight minutes into the third period. The Stars were caught up ice with no help on the back end, and it led to a goal from Lucas Carlsson who finished from the high slot. L'Esperance went top shelf for the equalizer three minutes later. The Stars possessed the puck for the majority of overtime play, and it paid off. Though several chances were generated by the likes of L'Esperance, Morin, and Condra, a loose dribbler left in front of the crease by Nick Caamano was all Mascherin needed to secure the victory. He nudged the rebound in for his twelfth goal of the year as Forsberg lost sight of the puck. Just like that, the Stars have picked up eleven out of twelve points in the past six games. 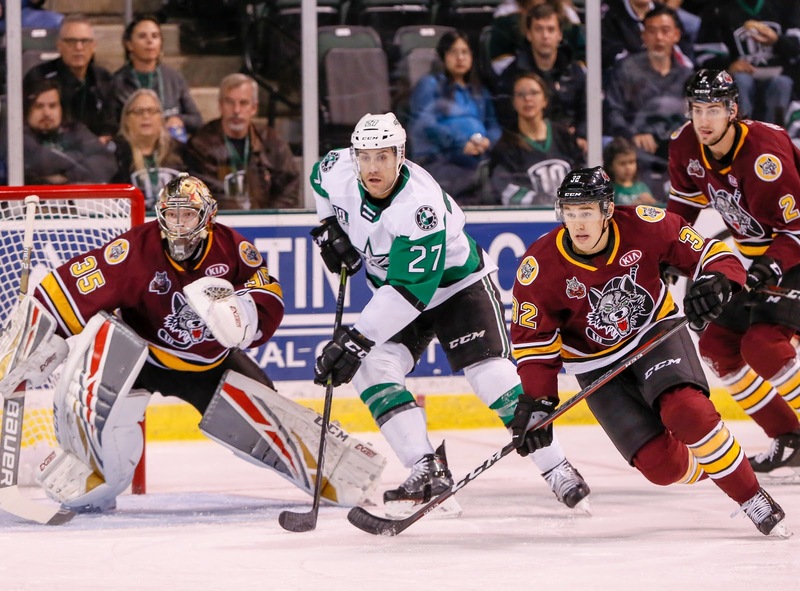 The Stars close out their road trip in a Tuesday matinee against the Chicago Wolves. The puck drops at 11:00 AM CST. Spencer Naas was recalled from Idaho prior to tonight's game in Rockford. Playing their third game in four nights, Texas rolls into Rockford with a five-game point streak in tact. With a humming power play that eventually got them a goal last night, Texas comes in with the second-ranked power play in the league (28.4%). The loss of Denis Gurianov for last night's game, and potentially for a while longer, takes a potent offensive weapon out of the lineup. 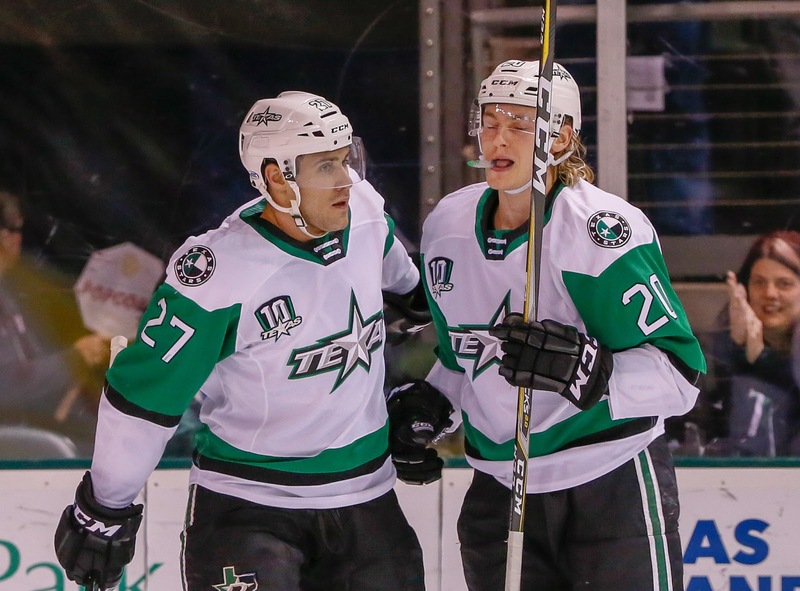 This Texas Stars team is showing its mettle by filling in when their top players get recalled. Rookie Joel L'Esperance and veteran captain Justin Dowling stepped up last night. Rookie Adam Mascherin has been in the mix these past two weeks as well. The IceHogs are coming to the game with a win last night in Grand Rapids. Curiously over the last six games for Rockford dating back to Thanksgiving, the club has either won 3-2 or been shutout entirely. The Texas Stars staged a revival of their 2017-18 season in Milwaukee this evening, trailing for most of the contest only to come back in the final period and earn an overtime point. Ultimately, they would fall in the extra frame 3-2 but not before a frantic comeback that saw them score twice in less than two minutes to set the Admirals on their heels. With the loss, the Stars broke up their winning streak at four but continued a point streak for the fifth straight game. Erik Condra was on the ice for the Stars' second goal of the game but did not pick up a point, ending his personal point streak at 11 games, tied for the franchise record. Milwaukee opened the scoring on a bad luck play down low. The puck ricocheted off the skates of Adam Mascherin and ended up on the stick of an uncovered Anthony Richard. Richard's ninth of the year came in the second minute of the game, putting Texas down early. In the second period, Frederic Allard added another goal to set the score at 0-2. The Texas power play had a mess of chances and has a bit less focus on it with the overtime point. However, down 2-0 and with five chances in the game at that point, it was starting to look like a sore spot. Joel L'Esperance made the power play count in the final frame, scoring his 13th of the year. Milwaukee was incensed as they were miffed at the initial penalty call on Brian Cooper, who made head contact with Colin Markison on a clear boarding call. Justin Dowling completed the comeback with a snipe from the left-wing side off a slick pass from Travis Morin. From there, both teams poured it on. Landon Bow had the best play of the remainder of regulation, sprawling to his right to block a point-blank chance with just over a minute left. The overtime period wouldn't last long. Just 21 seconds in, Richard collected his second of the game. The Stars were off balance to start the frame as they were unable to get the change they wanted, Ben Gleason coming off for Dillon Heatherington. Landon Bow stopped 19 of 22 in the loss, his first in two weeks. Texas picks up and heads out to Rockford tomorrow. 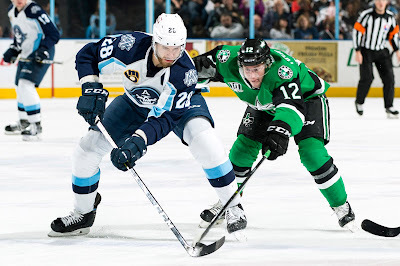 Heading into Friday's game against the Milwaukee Admirals, the Texas Stars are in the midst of a well-timed four game winning streak, each coming against division opponents ahead of them in the standings. If you ask head coach Derek Laxdal to weigh in on what that does for a team, he's far more concerned about taking each game as it comes rather than focusing on the big picture. "Every game you play galvanizes your team," he said. "They’re getting rewarded for their hard work. If you know our dressing room, we’ve got a great group of guys and they play hard for each other. I think that’s important as a team. And they want to win for each other. So you see that in their game and there’s a lot of pride on that bench." After Wednesday night's win over Iowa, Laxdal did specifically mention how recent back to back wins over the Milwaukee Admirals has had their team feeling confident in what they can achieve. If the Stars can go up into their barn and eke out another win, it will be another signature win in a season that got off to somewhat of a rocky start. Rather than worrying about that, Laxdal just wants to make sure their A game translates away from Cedar Park. "As we go along in the season I think the galvanization of our club will get better even in losses. If you grind one out and lose a game, you’re going to be stronger as a team moving forward. We’ve just gotta make sure we take this show on the road." Coming off his two-goal performance on Wednesday, veteran winger Michael Mersch likes what he sees from his team heading into Friday's tilt in Wisconsin. "It’s just a really good group," he said. "Good leadership and good young guys. It’s a lot of fun, especially when you’re winning. We’re looking forward to going [on the road] this weekend. When you win on the road, it’s a lot of fun." The Texas Stars knocked off the Central division-leading Iowa Wild on Wednesday night 6-3, running their current win streak to four games. The offense once again came in spades, with Texas receiving scoring from all over the lineup. Veteran forward Erik Condra scored two goals, extending his point streak to eleven games and tying Matthew Fraser’s team record set in 2012-13. Winger Michael Mersch also notched two goals in the effort. Roope Hintz and Denis Gurianov were strong with two helpers each, while Adam Mascherin scored the game-winning goal on the power play in the third period. A successive power play goal from Mersch salted the game away. Iowa made their presence felt in the opening minutes of the contest, showing why they currently lead the division. Two minutes in, Gerry Fitzgerald cleaned up a loose puck with his backhand to break scoreless play after a flurry of chances in front of Landon Bow. Bow finished the game with 25 saves on 28 shots. The Stars got things under control as the period moved along and answered with Mersch’s first goal right as their first power play expired to knot the score at one. Mersch’s 218 lb frame was unmovable in the crease as Gurianov found him for the deflection. The second period push concluded with a Colin Markison goal with a minute left. Initially, he beat everyone down ice for a loose puck and missed on a backhand chance. Colton Hargrove was there to force a turnover on the forecheck a second later and found Markison wide open on the back door. Hargrove notched his hundredth career point in the AHL with his helper on a Colin Markison goal. “You look at everybody’s stat lines, everybody’s got a lot of points,” said Mersch of the depth contributions. The Wild couldn’t get out of their own way in the third period, costing themselves a chance to get back in the game as they were parading to the penalty box to the tune of eleven total minutes. Laxdal rolled out his second unit during a 5-on-3 and was rewarded with Mascherin’s goal from the left circle. “They took advantage of it and that’s part of the inner competition of your group,” added Laxdal. The Stars begin a three-game road trip on Friday against the Milwaukee Admirals. The puck drops at 7:00 PM CST. 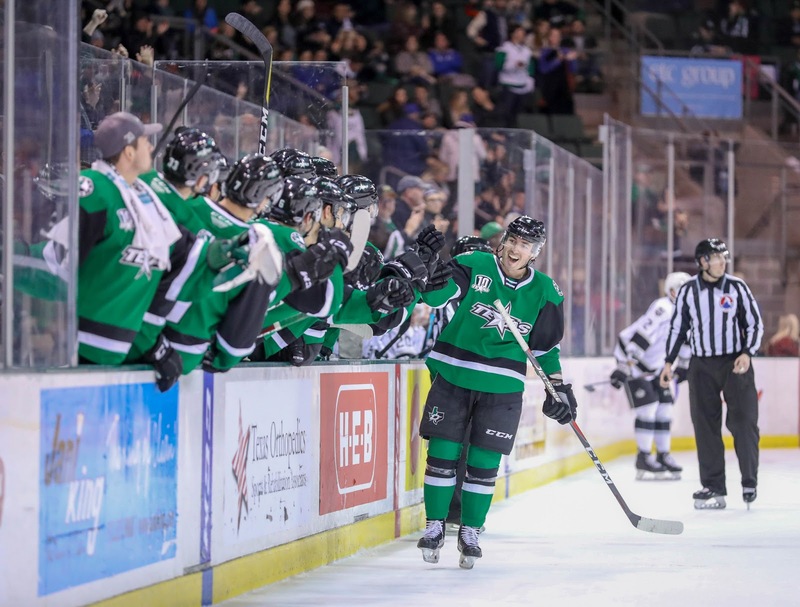 Texas Stars head coach Derek Laxdal mentioned last week how these division games are essentially worth four points and that his team is looking to move up the standings. Recently putting together an impressive three-game win streak within their division was a great start toward that goal but nothing more. Getting it done against the Iowa Wild, who currently sit atop the Central, is going to be a tall task, yet almost manditory if these Stars are who they think they can be. Usually, measuring stick games don't come this early in the season. But with the Stars offense, even more potent with the return of Roope Hintz, clicking at an elite level, the time to make their push could be now. They're simply playing their best hockey and rising to the occasion while they await the return of key blue-line reinforcements. The Stars have to be confident heading into Wednesday evening, as they went 2-0-0-1 in their first three match-ups against the Wild in October. Even so, they're going to need every bit of offense they can muster with Iowa icing arguably one of the top goaltender tandems in the AHL in rookie Kaapo Kahkonen (.933 SP) and savvy vet Andrew Hammond (.911 SP). Kahkonen's save percentage and 1.94 goals against are both tops in the AHL. He's no ordinary rookie. 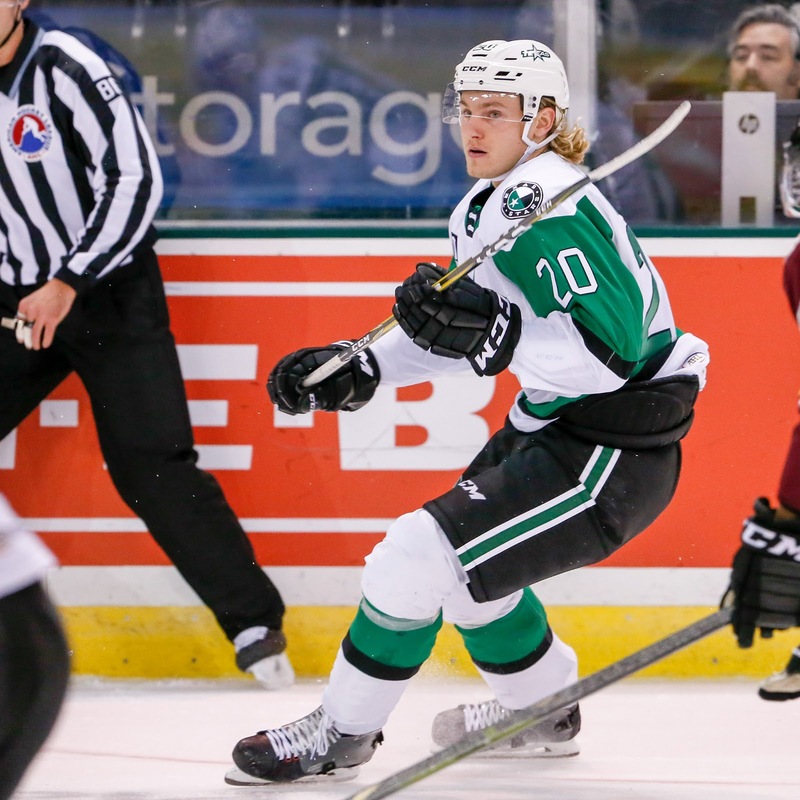 Roope Hintz is on his way back to the Texas Stars. At this point, the young forward has recorded more games in the NHL than AHL on the season. He is being sent down as part of a series of moves to make room for Martin Hanzal to come off IR. In a related move, Dallas also waived and lost Gemel Smith to the Boston Bruins earlier today. The former Texas Star had 186 AHL games to his name, all in a Texas sweater, and 77 NHL games with Dallas. Dallas Stars General Manager Jim Nill announced today that the club has reassigned left wing Roope Hintz to the Texas Stars. Hintz, 22, has recorded three points (2-1=3) in 14 NHL games with Dallas during the 2018-19 campaign. Hintz recorded his first career NHL goal on Nov. 18 against the New York Islanders. The forward has also appeared in nine AHL contests with Texas so far this season, registering 11 points (4-7=11), including two power play goals. The 6-foot-3, 215-pound native of Tampere, Finland was originally selected by Dallas in the second round (49th overall) of the 2015 NHL Draft. In 79 career AHL games, Hintz has recorded 46 points (24-22=46) including nine power play goals. The Texas Stars finished off their three game in three night road trip with a 7-4 win over the Chicago Wolves. 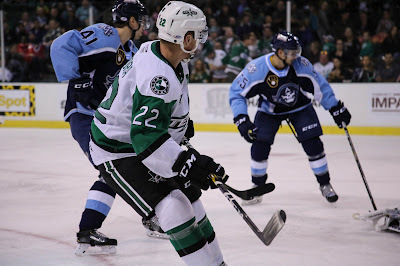 Stars alternate captain Erik Condra was sensational as he paced the team in scoring with two goals and three primary assists. Travis Morin and Nick Caamano both had two goals in the contest, and captain Justin Dowling also found twine. In his tenth season as a professional, Condra continued his eight game point streak to push his season total to 26, tying him for third in league scoring as of this posting. He got off to a hot start with two points in the first period, giving the Stars an early 2-0 lead. Less than four minutes into the contest, he cleaned up a loosed puck after defenseman Shane Hanna fired it off the back wall behind the net. Condra then set up Morin on the back door for an easy tap-in goal a couple minutes later. The only fly in the ointment for the Stars on the night was their penalty kill. They went 50% in the game and went to the box six times. Wolves defenseman Dylan Coghlan was the first to make them pay with his one timer from the left circle when the Stars went shorthanded with two minutes left in the opening frame. Phil Desrosiers got the start in net for the Stars and had a pedestrian night with 18 saves on 22 shots. It was really a weird game for a Stars goaltender as the Wolves didn't crack double digits in shot attempts until late in the second period. Dowling answered Coghlan's goal four minutes into the second period with a power play one timer of his own. The goal gave Condra his third point for the sweet set up. Condra continued his dazzling display a couple minutes later when Ben Gleason sprung him for a clean breakaway, pushing the Stars lead to three. Wolves forward Brandon Pirri also had a fine game and now sits tied with Condra's scoring total. His power play came with seven minutes left in the middle frame. Caamano's first goal was the answer on a weird play. Defenseman Brady Norrish set him up for a couple of attempts in Maxime Lagace's crease. The call on the ice was initially ruled in Lagace's favor as it appeared he did just enough to keep the puck from crossing the goal line. After the next whistle, the play was reviewed and Caamano was awarded the goal. The Wolves weren't finished with their strong showing on the power play, with forward Reid Duke cleaning up a loose puck less than four minutes into the third period. Caamano tallied his second marker on the following shift after a hard working forecheck by Colton Hargrove to force the turnover. Morin's power play goal came about ten minutes later to give the Stars a seven spot and Condra his fifth point. Frustrations boiled over for the Wolves late in the game when they were down 7-3. Lagace swatted Stars center James Phelan in the back of the head on one play after he was parked in the crease. When Phelan turned around to take issue, Alex Gallant streaked over from center ice and threw a sucker punch on Phelan to give the Stars some time on the power play. Matthew Weis scored with a minute and a half left of play to further muddy Desrosiers' numbers, but the Wolves never truly threatened in this game. The Stars head home to Cedar Park to take on the Milwaukee Admirals on Wednesday. The puck drops at 7:00 PM CST.